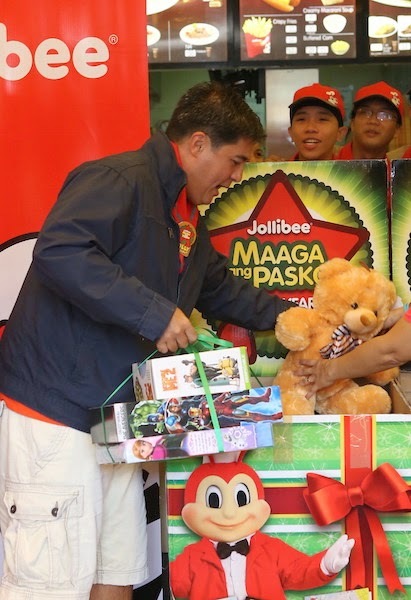 Original Jolly Toy Scout Aga Muhlach makes his Christmas donation in the Maaga ang Pasko box during the launch in Jollibee Canlubang. The kids and the kids at heart trooped down to their favorite Jollibee branches as Jollibee kicks off the earliest and longest christmas season. Jollibee celebrates the 20th year of Maaga ang Pasko launch as Jollibee branches featured celebrities, Aga Muhlach, Nadine Lustre and The Voice Kids Top 4 finalists Lyca Gairanod, Juan Karlos Labajo, Darlene Vibares and Darren Espanto and chorale groups for its early christmas carole. At Jollibee Greenmeadows in Quezon City, The Voice Kids Top 4 finalists Lyca Gairanod, Juan Karlos Labajo, and Darlene Vibares performed their trademark songs and joined the Singles for Christ choir in singing the Maaga ang Pasko jingle. The young talents were also introduced as the newest endorsers of the Jollibee Kids Club, together with their fellow finalist Darren Espanto. Jollibee joins Nadine as the Cheesy Bacon Mushroom Yum ambassador drops her donation at the Maaga ang Pasko box in Jollibee Mabalacat. At Jollibee Mabalacat in Pampanga, young sensation Nadine Lustre brought her own family to take part in the gift-giving campaign. “Our family has been supporting Maaga ang Pasko even before I became a Jollibee endorser. I feel blessed because as an official member of the Jollibee family, I can now do more and influence more people to share what they have and make kids happy this Christmas.” The actress also serenaded her fans with songs from her debut album, as well as joyful Christmas jingles with the Lumen Anima Chorale. Jollibee then paid tribute to long-time ambassador and original Jolly Toy Scout Aga Muhlach at Jollibee Canlubang in a similar caroling activity. Together with members of the Jollibee marketing team, the seasoned actor gamely joined the Lumen Anima Chorale in a more upbeat rendition of the Maaga ang Pasko jingle. Through the decades, Jollibee Maaga ang Pasko has shown that it’s never too early to learn to share your blessings with others. The celebrity guests each led the gift-giving ceremony by making their own toy and book donations together with members of the Jollibee Kids Club. Jollibee customers showed their support by lining up to drop their donations in the Maaga ang Pasko boxes. “For the 20th year of Maaga ang Pasko, we’re targeting to bring the magic of toys and books to the most number of children in the history of the campaign. 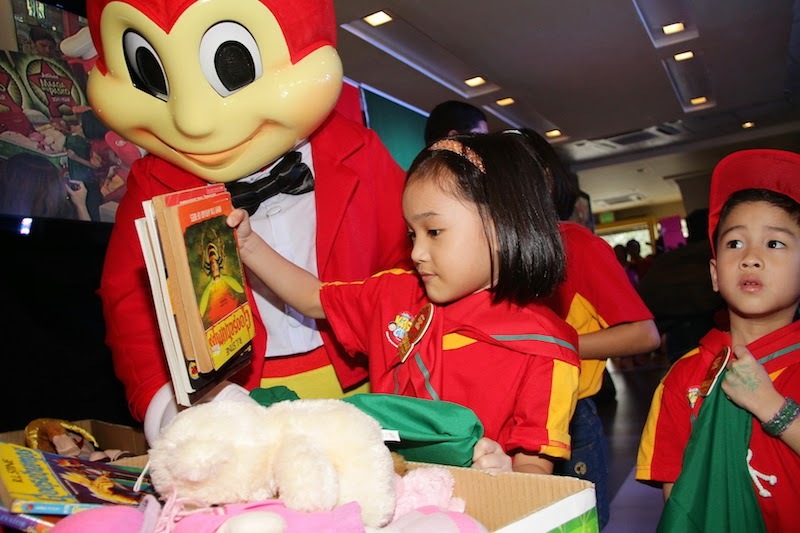 We are once again counting on the support of kind-hearted Filipino families from all over the globe to make this year the ‘pinaka-maaga, pinakamahaba at pinakamalaking Pasko’ for our Filipino kids,” said Jollibee Vice-President for Marketing Harvey Ong. The Voice Kids’ winner Lyca Gairanod, and finalists Darlene Vibares and Juan Karlos Labajo led the Maaga ang Pasko donations at Jollibee Greenmeadows. Aside from dropping donations in Maaga ang Pasko boxes in Jollibee stores nationwide, anyone can also take part in the campaign by making online donations at www.jollibee.com.ph/MaagaAngPasko. Early Christmas shoppers can also buy and directly drop their donations in all Goodwill Bookstore and Toy Kingdom stores.